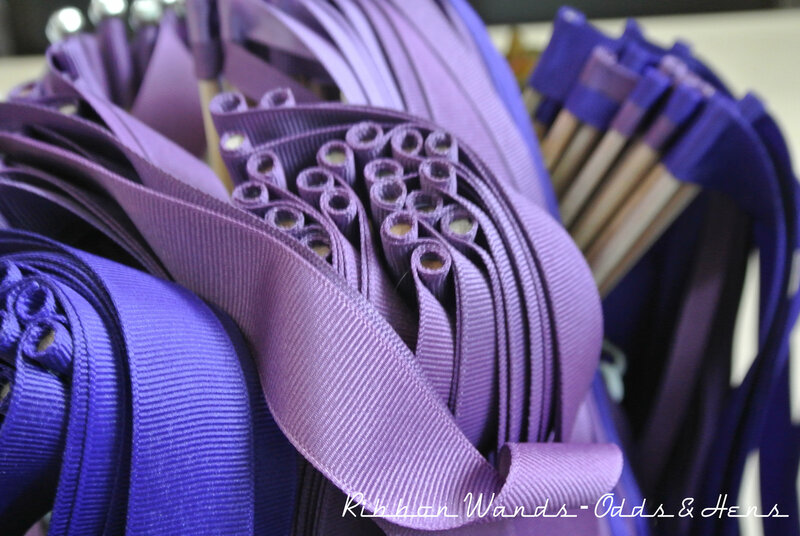 Ribbon Wands : Easy DIY for any party or wedding – Odds & Hens : Ramblings. Creations. This might just be the most versatile party favor since donating to a charity. Ribbon wands! You can make these for just about every occasion – kids party, baby shower, wedding recessional, reception, Old School gymnastics re-enactment (or to jazz up your version of Napoleon Dynamite), music class (calling all teachers) or every day imagination play. This DIY is for an upcoming wedding where the venue does not allow rice, confetti, birds, butterflies, bubbles, fireworks etc (read almost anything fun). Note Bells and Ribbons are totally kosher. Bells are not necessary but would require extra hoots from wavers. Pictures of the wands in full celebration action to be posted after the special day. Not crafty? There are quite a few Etsy shops that offer them, including myself @ oddsandhens. Let’s chat! I would be happy to teach your bridesmaids or MIL how to do this too. Supply List and Expenses – everything can be found at your local craft store (Michaels, Joann, Hobby Lobby) or well stocked craft room. This was for about 100 wands. If you have time and access to buy ribbon in bulk, that will help to decrease the cost possibly but find one that will send you samples to see the colors. Be sure to use coupons! I love the craft store apps that organize them for me. Time estimate and “cost” will really vary with how much experimenting you do and how you value your time….. I made 100 over the course of two movies (Olympus Has Fallen and Oblivion) and an extra two or three hours of Criminal Minds. Get inspired! Decide on what colors, how many strands length, bell or no etc. I did a mix of purples (I swear even though it photographs kinda blue) and widths (7/8, 2 x 3/8, 5/8 + 3/8) due in large part to the fact that I clean out two craft stores to get enough ribbon. After deciding on a length, be sure to calculate how much ribbon you need. For example one spool of 7/8 inch grosgrain ribbon contained 18 feet of ribbon, so if the ribbons are 20 inches (a little over 1.5 times the length of the dowel) then take 18 x 12 and divide by 20 to get the number of ribbon lengths from each spool (aka 216 inches or 10.8 lengths. So fudge some lengths a bit to avoid waste). You might also decide to paint the dowels too. Go shopping! Depending on your business model or accounting, this might be good time to track. I don’t (yet) as I love wandering the aisles and invariable take detours. Ready. Set. Cut the ribbon. Attach the bell to the end of each one with knot on the inside and loop through the other so that it pulls tight to the top of the dowel. Knot again. Put a dab of Fray check on the threads. Here is a version with gold bells. 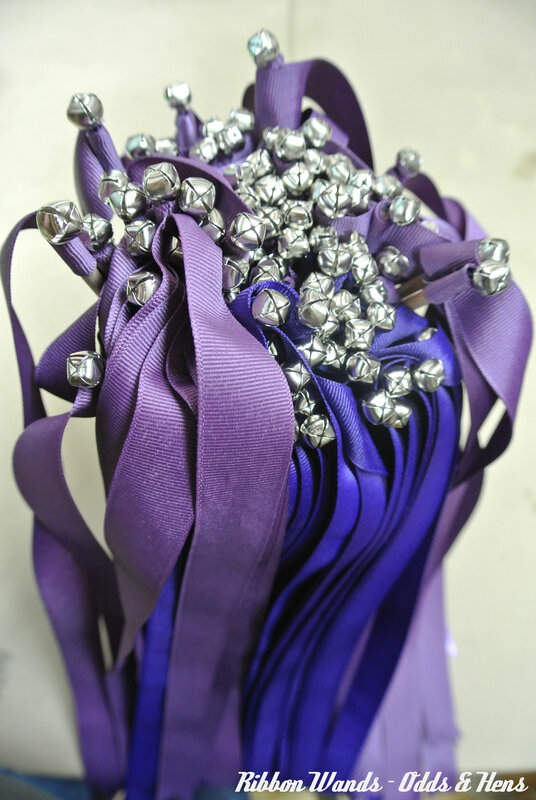 Trim the ribbons and finish the ends wither with a heat source to melt or Fray check. You could also use pinking shears, but it will still unravel a bit. hi, where did you purchase the dowel rods? Top post of 2013!! Thank you everyone. Wonderful! Best of luck, I know they will turn out great. Let me know if you have questions!